I’ve been meaning to write about this since P’s birthday in November. I’m finally sitting here at my computer and I remembered!!!! 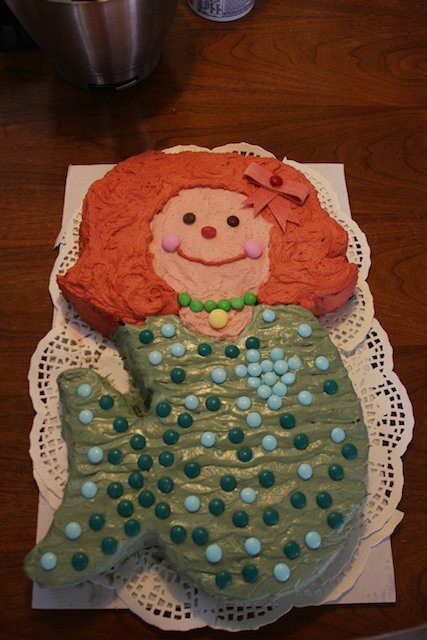 P had an “under the sea/Aerial” birthday theme this year. I made her cake as usual. 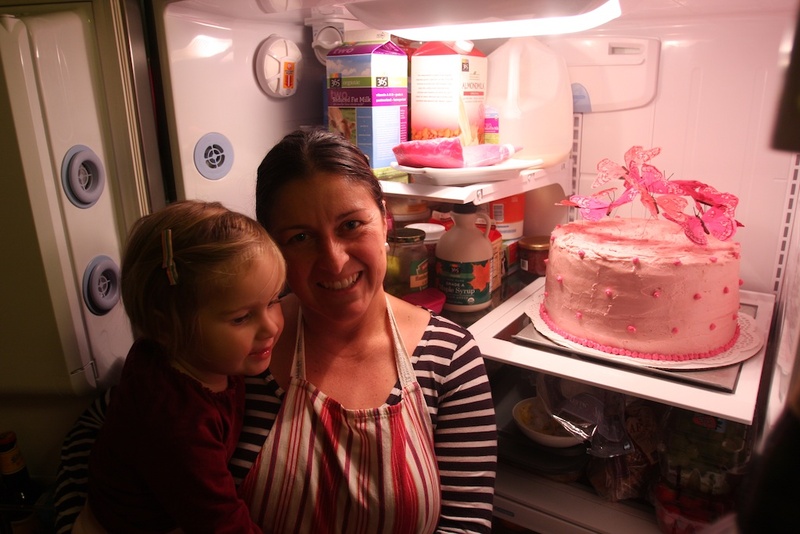 It dawned on me this time around why baking her cake is so important to me. The fondest memory I have of my dad is the last time he came out to visit us. He was in his last stages of cancer and he made the HUGE effort of flying out for P’s birthday. He flew out from Florida in late November and died in mid January. That’s how far along he was. P turned 2 that year. 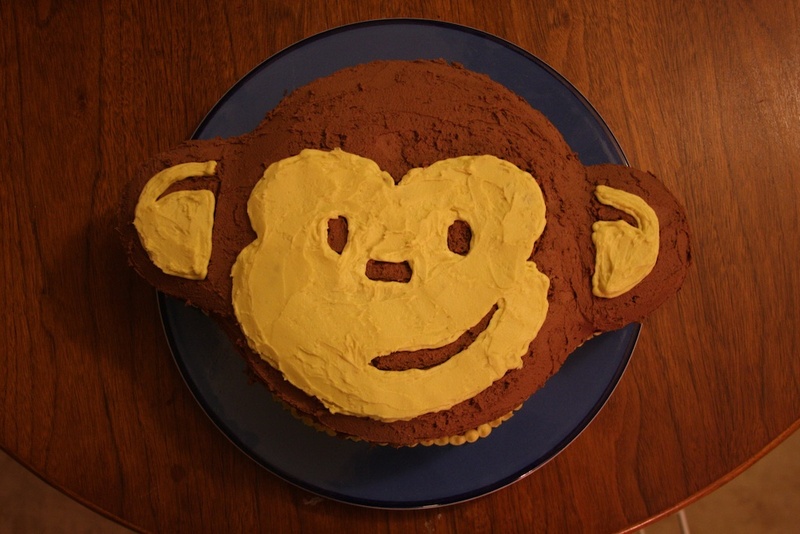 Her birthday theme was monkeys so I made her a monkey cake. It was the first time I took the task on myself. I’m not good with icing and yet the cake turned out quite amazing. I was up till 2am making the thing and my dad stayed up with me. He sat at the dinner table, next to the kitchen patiently watching. At the time I thought what else does he have to do. Now I know he must have been in a lot of pain and yet he stayed. When I was done I was so proud of myself and I kept saying “you can’t believe what an accomplishment this is for me”. For the very first time in my life I saw the look of pride on my dad’s face. He was proud of me for doing something that meant a lot to me. My dad had never supported any of my interest. The feeling was amazing and I think it was a new one for both of us. Since then I swear I can feel my dad when I’m cooking late at night. When everyone has gone to bed and it’s just me and my ingredients I feel he’s there, sitting, watching me. 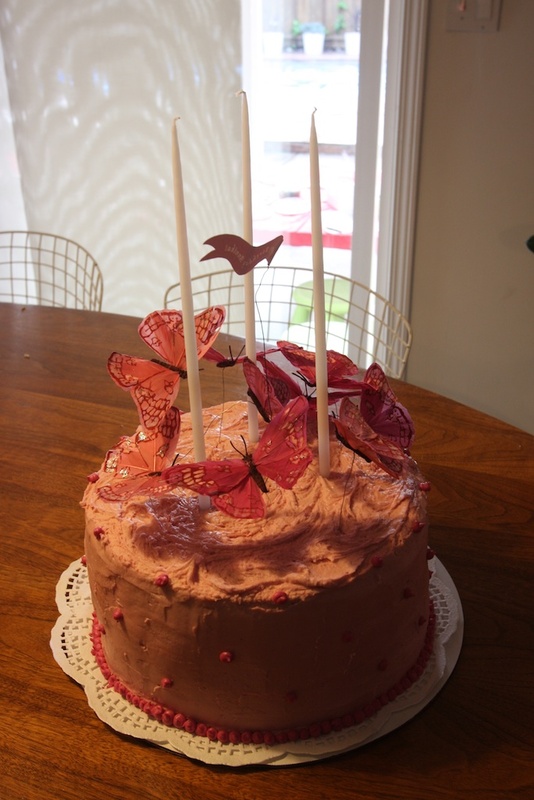 The following year I made a big butterfly cake for P and I felt him subconsciously. It wasn’t until this year that I actually looked forward to a night of baking and I finally figured out why. It’s our annual reunion. I will bake P’s cakes for as long as I can. Dave has offered to buy them knowing how much I try to take on for each birthday. But I told him I’ll outsource the food, do the party at another venue but the cake is off limits. 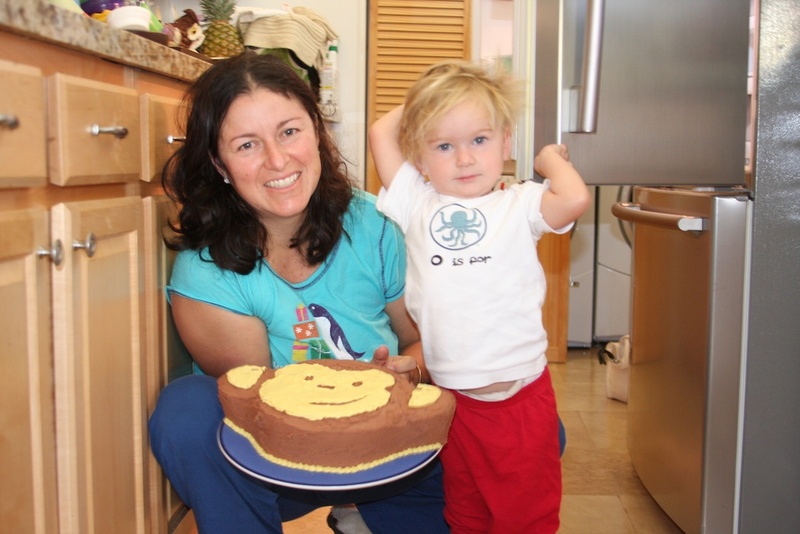 The cake is a way for our entire family, the one living and the one who has passed, to celebrate and stay together. And for me, it’s like I get to feel again like I did that night. I get to feel my father be proud of me. That night of baking was the only time I ever sensed my dad’s pride. He never said the words: “I’m proud of you” to me. These are pictures of P’s birthday cakes. I’m proud of all of them and I think my dad is to. 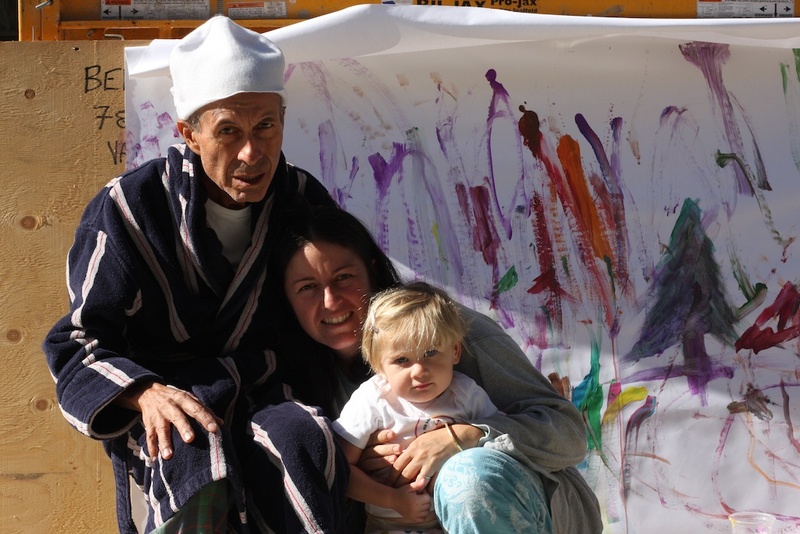 My dad with P and me the morning after her party. If you’ve ever known anyone with cancer you’ll recognize the hat. 4th Birthday: Aerial/Under the Sea. Chocolate cake with buttercream frosting. What a sad and wonderful story. P will have such a nice memories of all the effort you make for her birthdays! The cakes look like something you would see in a baking magazine. Well done. Thanks Jurga! They've been a lot of fun to make….a little stressful at times but a fun challenge. At this point P does take pride in knowing I make her cakes. She tells her friends all the time. We'll see how long that lasts! 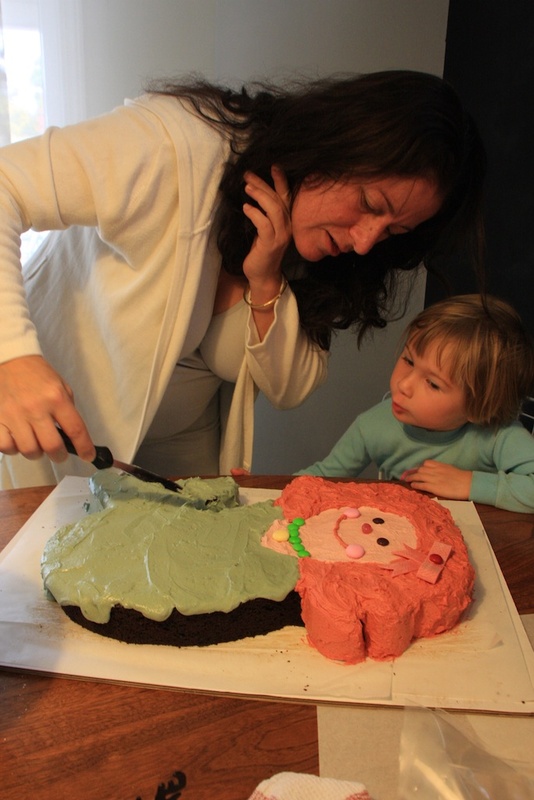 I didn't think when I clicked on a b-day cake blog that I'd end up crying… but I did. It's so wonderful to see approval and pride from your parents. Makes me realize how I need to make sure my kids know how proud I am of them. Awww, thanks! Yes, I'm hoping it's a feeling my kids may even take for granted.